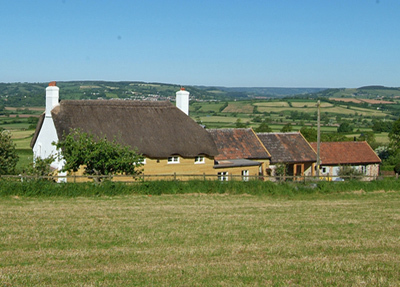 Sellers Wood Farm lies among some of east Devon’s most picturesque countryside sitting in an elevated position on the slopes of the Axe Valley AONB. Lying within easy reach of the house are the popular coastal towns of Lyme Regis and Sidmouth and the Jurassic Coast. The house dates back to circa 1747 and was still farmed until the 1960s when it was converted into a private residence. The current owners have undertaken a comprehensive renovation and expansion project and the house now boasts an attractive kitchen/breakfast room with Aga, two reception rooms and five bedrooms. There is a also a ground floor one bedroom apartment. Outside is a detached studio, large timber barn, various sheds and stores and a garden extending to about 1.7 acres.